A few weeks ago in London, transitioning from my dad's house in the country to my brother's house in the city, I decided to leave my husfriend in town to snap photos and enjoy the sun while I dropped off our stuff. 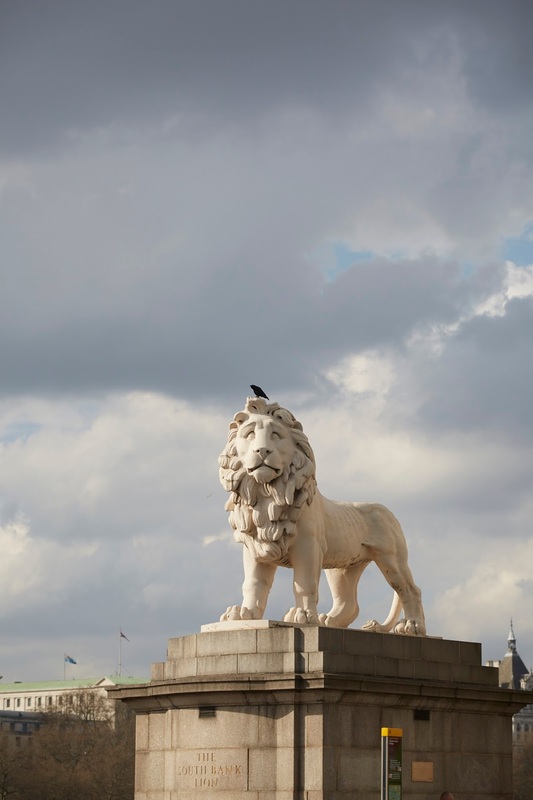 Both our phones were dead in the classic 'adult fail' style we so regularly commit, so we decided to kick it old school and arrange to meet in front of the Southbank Lion (which inspired the my recent children's book about Love and Peace) an hour from our separation. Being the terrible person that I am, I left him waiting for an extra 45 min, on the edge of Westminister bridge watching the world go by. For those that don't know London well, Westminster bridge connects the Southbank, to the North. On the South side, there is Saint Thomas' Hospital where my niece and nephew were born, and a large stone Lion which seems to guard the stairway that reaches the London Eye below. Across the river are the Houses of Parliament and its iconic Big Ben, making it a popular spot for tourists and locals. This was the same bridge, that only days before, was the site of a 'terrorist attack'. One which a 52-year-old Briton named Khalid Masood, drove a car into pedestrians on the pavement along the south side of the bridge I left my husfriend on, injuring more than 50 people and killing four. There were bouquest of flowers were gathered around one of the bridge's light posts on the side closest to the hospital, juxtaposing for me symbols of very recent death with a symbol of very recent life. And it wasn't until I saw them that I realised how numb I've become to 'terrorist attacks' on lands I have or still inhabit. 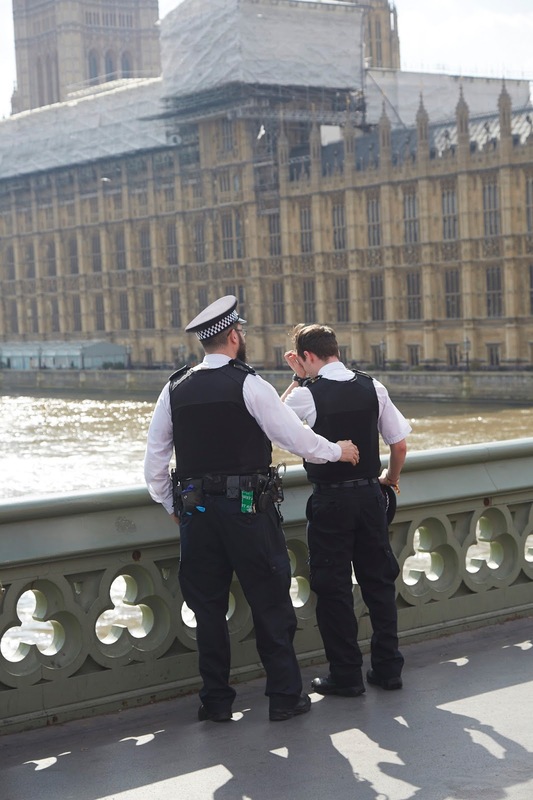 My entire family, apart from me, had been in London during the series of attacks on tubes and buses in 2005, still now my family dwells within walking distance of Westminister Bridge, and my husfriend and I were in Paris during the attacks there as well. It's frequent but mild this side of the pond, and I have no doubts it will continue to happen as the west continues to wage war. The truth is, I don't feel sorry for us in the slightest. We pay a small price compared to that of those who are daily avoiding dropped bombs. While Shane waited for my arrival he snapped a photo of two police officers, one consoling the other as he wept at the site of the deaths. When I saw it, I felt my heart uncomfortably inch itself open. My apathy towards 'my own' has been building since my teens, when 9/11 brought the first wave of inconceivable war. It has continued to grow over time, fed by frustrations and judgements towards of my 'own' compatriots and neighbours (my country-less self-included), who do nought and nothing about pain, which we ourselves continue to allow and cause. We (and when I say 'we', I mean us Westerners) live within a certain propaganda system which makes us feel that everything we do is without fault. So long as we pay our taxes, consume goods and vote in national elections, we've done our part. We are taught to believe that we are unable to cause change, and are so distracted by celebrities, giant orange toddlers, and maintaining our lifestyles, that all of us struggle to really deeply search beyond. Meanwhile, members of our own species are dealing with devastating death daily and as their pain rises, so does ours; whether it's through empathy, frustration, fear, or loss of life. It's not that those labelled as terrorists are 'monsters', I find it quite reasonable to think that if a country was responsible for the death of my entire family; my parents, my siblings, my child, my neighbours, my friends, I might adjust my all loving peaceful and idealistic self to something compelled by the dark. Wrath would likely direct my course and I'm not sure after unthinkable devastation caused by a ruthless coalition of countries, I'd really be the one to blame. Our governments increase our fear of 'other', whether it be immigrants, terrorists, or the poor though they themselves cause more death through greed, ignorance or apathy than the three feared groups alone. White extremists are more likely to cause Westerners harm than Jihadists. Yet fear rises, and we vote on national security valuing our 'personal safety' when in truth the only way to ensure our own safety is to stop our countries from participating in these incredibly pointless, aggressive and endless wars. If we call attacks on our innocent citizens an 'act of terrorism' then so are our attacks on the citizens of other countries. If this was a kindergarten class it would be us (the West) who would have been expelled, and possibly put under study in a school for psychopathic children to figure out why we can't just get along. As it is us who drops a truckload of boulders over our neighbour who threw nothing but a stone. The United States is the only country in the world that has been condemned for international terrorism by the World Court. Yet all our little countries (or big in my Candian case) fall in line, join in, and us, their citizens let it go on, and on, and on. I started watching Yann Arthus-Bertrand's newest film Humans (it's free to watch! ), it won't change the world but it might change us as individuals. Send it to your family members who have displayed apathy through their voting choices or in their daily lives, and watch it yourself to feel 'all the feels' so you might enhance your own empathy as well. - First, support renewable energy. Welcome it into your home and supporting policies and investments in your country. Much of the 'war on terror' is driven by our lust and reliance on oil, and the power and funds it bestows. If we reduce our reliance, we reduce our 'need' for such wars. - Second, defund the bad banks, I wrote a whole blog post/vlog post HERE about how to do divest, with a list of better banks to work with. By defunding the banks you're defunding some of the investors in the money maker that is war. - Third, there is a town in Maine, along with the city of Portland, which has signed the first resolution to demand the US congress stop funding wars. They've published their model resolution which you can use for your town/city and adjust/translate if you're not in the Divided States of America. You can download/copy it HERE. Action differs for each country but one way to stop terrorism is to stop allowing your government from participate in its causes. Keep track of what is happening in your city and your country. There is an awesome app for Americans called 'Daily Action', which sends you daily notifications about issues in your area and beyond which you can influence while you're in line for a coffee or sitting on the bus. If you're not in the U.S you get the same type of info by attending town hall meetings, reading your local newspaper and signing up to newsletters from your local representatives. Protesting attracts more attention to a cause than doing nothing. If you are staying informed, you will undoubtedly find things you don't like in your local or federal systems,. You can sign up to the likes of Democracy Now, Avaaz, Credo Action, and Moveon which will send you petitions to sign and also keep you up to date with issues arising that you can lend your voice to. Please comment below with any further actions or ideas you have discovered in your own research, I'm a very keen to increase my understanding of possible solutions or aids and help spread the word. I'm not sure the word is 'enjoyed' your post. I am a new subscriber to the blog over the last 2 months but I......appreciated? your different point of view. I say different because I have seen a lot of posts, comments on various terrorists attacks including the London attack recently, but nothing with a unique twist and opinion like yours. I must say that it's refreshing, painfully raw and upfront to me. You hit me personally with some hard truths. I get a job, pay my taxes, vote, give my opinion on social media, I'm good. I'm a good person. I feel sorry for those who suffer from a distance and I mean a real distance, through my actions I do absolutely nothing to aid, assist or even promote the idea of helping our fellow kind westerners or not. You talk about the suffering of all those innocents who have lost their lives regardless of country. For that, I am thankful, you have reminded me that there is no US vs THEM. That there are people dying who ARE innocent. You provided some helpful ideas that I can look into in order to enact change within myself and hopefully spread that out into my family and so on. I love reading this. Thank you for putting my feelings into words. You are so awesome! I do not think I've read a single thing like this before. So nice to find somebody with some original thoughts on this topic. Seriously.. thank you for starting this up. This web site is one thing that's needed on the web, someone with some originality!